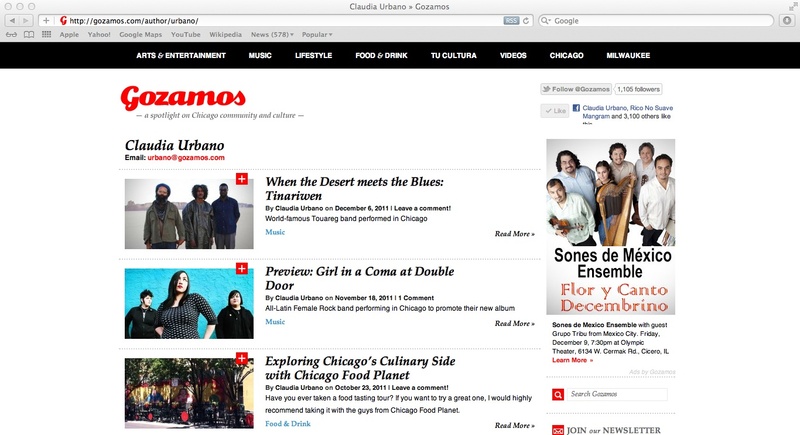 Peru 21, a major Peruvian national newspaper, published an article about a dance flashmob Chicago Urbanite produced to promote Peruvian culture in Chicago. The article became the sixth-most-viewed on its website within a day. The event was also retweeted by TV Peru, the official broadcasting news network of the Peruvian government, as well as by other celebrities and journalists in Peru and the United States. The video generated intense buzz and more than 3000 YouTube views in three days. In 2012, Chicago Urbanite conducted on-camera interviews with members of nonprofit arts organizations in Chicago for Chicago Access Network Television (CAN TV). I write for the music and culture section of Gozamos Magazine, a modern online magazine and community for young Latinos in Chicago and others passionate about their cultural heritage.